The Overland Track is a pilgrimage for many Australian walkers, and is widely recognised as one of the best multi-day walks in the country. 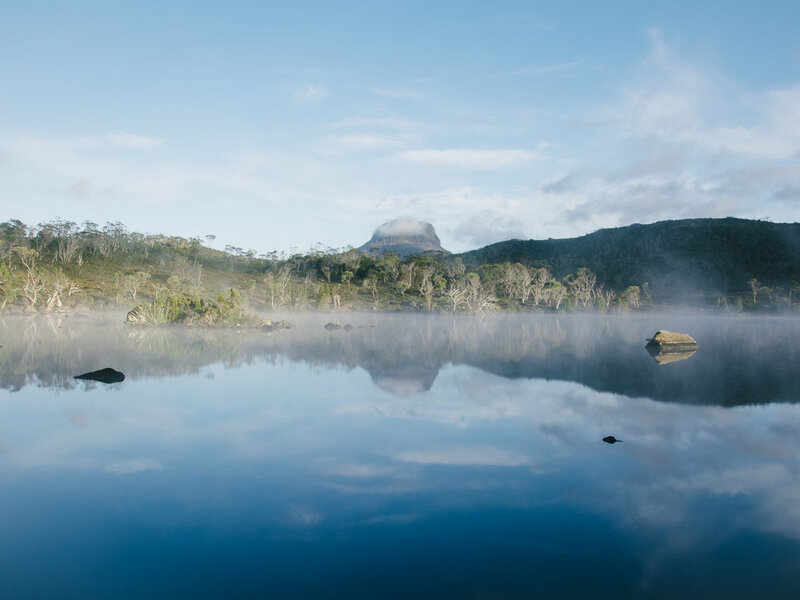 The track starts at Cradle Mountain and traverses 65km of remarkable wilderness through rugged mountains, alpine plains and dense rainforest to Lake St Clair, Australia's deepest lake. The trail is well formed and easy to follow for the majority of the walk, with basic huts and campsites spread along the trail. Most people choose to complete the walk in six days, which allows time to take in the magnificent surrounds and explore some of the many side trails along the way. As many of you know, there is nothing I enjoy more than spending time in nature, so this year for my birthday, Madeleine and I set out on the overland track with our families. You will get wet. 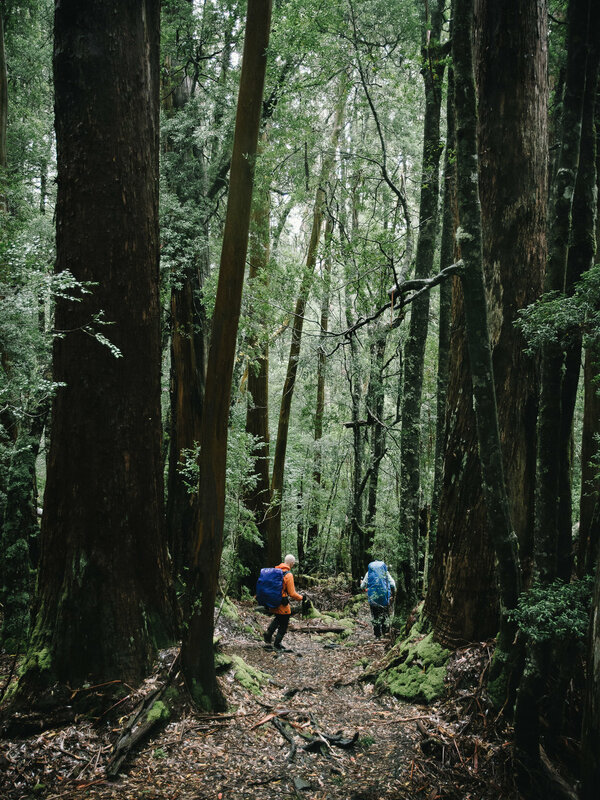 On average, it rains about 200 days of the year on the Overland Track, so invest in quality rain gear before you go, and make sure to keep a dry change of camp clothes. Pack light but sensibly. The weather can be extreme at any time of year - we walked in February, and encountered sleet, strong wind and heavy rain - snow had also fallen in the days before we left. A full packing list can be found on the Overland Track Website. Bring a tent. There are cabins on the track, but they aren't big enough to sleep everyone comfortably. You will also need a tent in case of emergency, as the weather can change fast. There is no phone service. To me, this is part of the appeal of a walk like this - you will be cut off from modern life and unable to contact anyone while you're on the trail. Leave no trace. Familiarise yourself with the seven leave no trace principles to help protect this remarkable environment. Plan your transport. The walk is a one-way trail, and it's a 3.5 hour drive to get back to the start - options are available to help with logistics, such as Overland Track Transport. A $200 booking fee applies during the walking season (October - May). This fee pays for maintenance of the track and huts, and helps minimise your environmental impact. You will also need a parks pass in order to access Tasmania's National Parks. We stayed at Cradle Mountain the night before setting out so that we could make an early start. The first day is one of the longer days on the walk, and we wanted to allow ourselves ample time to stop and enjoy the scenery along the way. We set out from Ronny Creek on a moody grey morning and slowly made our way uphill through beautiful rainforest and across open plains toward Kitchen Hut for lunch. As the fog lifted throughout the morning, we were treated to incredible views of rugged dolerite mountains, glacial lakes and deep gorges. This is one of the higher sections of the main trail and the views of the surrounding landscape make for an incredibly rewarding experience after the constant climb during the morning. We continued walking around the western side of Cradle Mountain past Fury Gorge through ancient pine forests and open alpine plains before descending into Waterfall Valley where we set up camp in the shadow of Barn Bluff and spent the afternoon relaxing and playing card games. Day two of the Overland Track is by far the shortest section, covering less than 8km across relatively flat and easy terrain. We awoke to light drizzle and Barn Bluff was no longer visible from camp, so delayed our start a little to let the weather pass before setting out. There is a short side-trip on this section of the walk to Lake Will, so we made a detour there for morning tea on a small secluded beach bordered by ancient King Billy Pines - some of the oldest living things on the planet at over 2,000 years old. Being in the presence of these ancient trees is always a humbling experience, and a reminder of the fleetingness of our own time here. By the time we finished our cup of tea, the rain was becoming heavier so we made a dash back to the main trail to get our packs and walk to Windermere Hut for lunch and a swim. 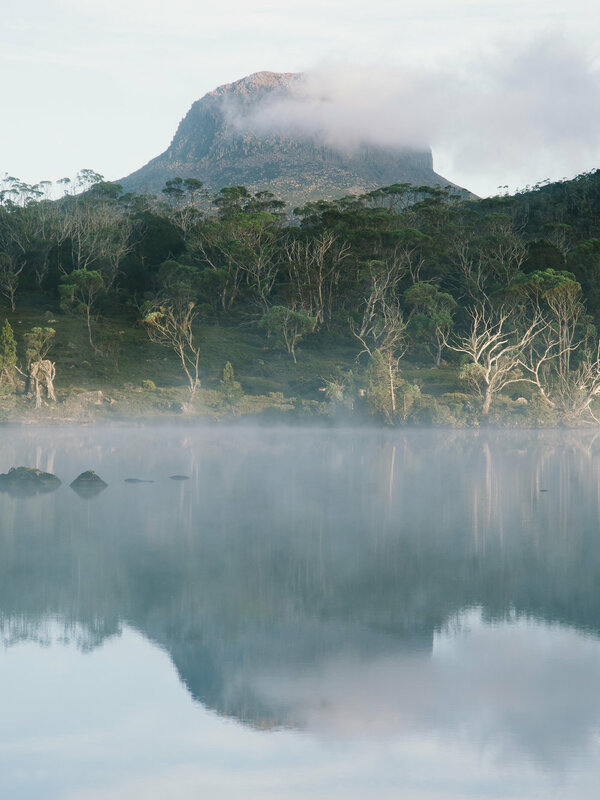 The third day on the Overland Track was a highlight for me, waking early to catch the sunrise by Lake Windermere as the weather cleared from the previous day. It was so refreshing waking early and feeling the crunch of frost beneath my feet as I wandered to the lake shore around five minutes from our camp. Spending time alone in the wilderness like this is a wonderful experience and after two days of walking, all of the little worries and anxieties that come with modern life had disappeared. The trip between Lake Windermere and New Pelion Hut is the longest on the Overland Track, and covers an incredibly diverse landscape including the wide open plains of Pine Forest Moor and densely forested slopes of Mount Pelion West. There is a beautiful lunch stop at the Forth River, which was a welcome respite on what turned out to be the warmest day on the trail. Word of warning though, beware of the mosquitoes if you stop too long! After around six hours of walking we arrived at New Pelion Hut, by far the largest and most luxurious hut on the Overland Track (it can sleep up to 60 people in bad weather!). We settled in and had a cup of tea before heading to the Old Pelion Hut and a swim in an icy creek nearby - the cold water was so refreshing and helped heal a few sore bodies in our group. The bushland around New Pelion Hut was teeming with wildlife - we saw Wombats, Pademelons and an Echidna fossicking around for a feed during the early evening. We awoke to a gusty, overcast morning and the weather forecast for rain was looking like being correct, which dashed our hopes of scaling Mount Ossa. We decided to opt for head-to-toe rain gear sensing what was to come. This turned out to be a wise move, as within minutes of leaving we found ourselves caught in a large thunderstorm - it was a surreal experience as we climbed through the ancient rainforest with heavy rain falling and thunder echoing around the valley. By the time we reached Pelion Gap the thunderstorm had passed, but a cold change followed bringing sleet and strong winds that blew me off track a couple of times - we later found out that parts of Tasmania had recorded 146kmh wind gusts (equivalent of a Category 2 Cyclone) that day! After the morning's weather, everybody was looking for a place in the hut that night, and places to hang clothes were at a premium - we ended up using tent ropes to hang wet clothes between the ceiling beams of the hut. 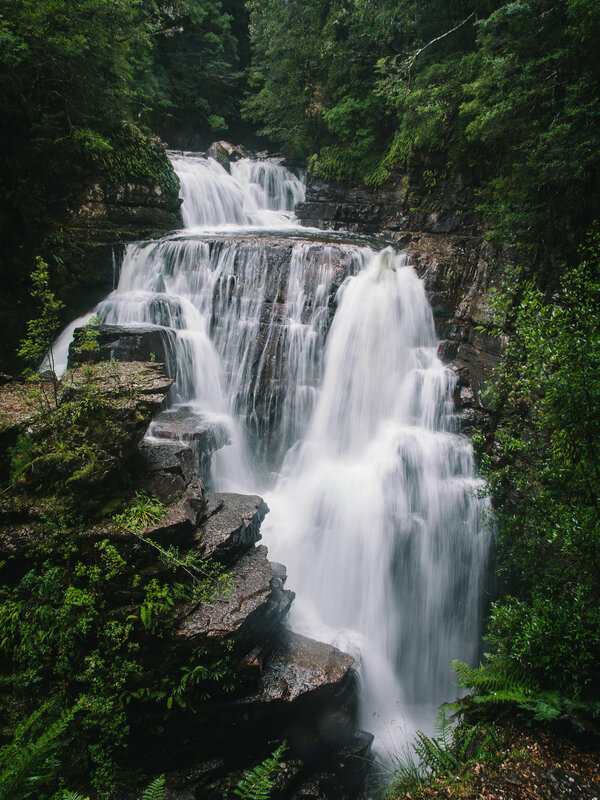 Day five of the Overland Track meanders almost entirely through thick rainforest, with a few spectacular waterfalls a short walk from the main trail on the Mersey River. Much of the track consists of tree roots and other natural surfaces, so requires a little more concentration than previous days. Our walking clothes had only partially dried in the hut overnight, so we set out in damp clothes reminding ourselves we would have been wet again within minutes anyway given the continuing rain. After around an hour of walking, we arrived at the historic Du Cane Hut, built in 1910 by a local trapper. The hut is very basic and should be used only in emergency, but we stopped for a drink and brief respite from the rain before continuing. After another 30 minutes or so of walking we arrived at the first of two side-trails which lead to some spectacular waterfalls on the Mersey River. The first trail leads to D'Alton and Fergusson Falls and is a short 30-minute return walk from the Overland Track. Not much further along the main trail is the turnoff to Hartnett Falls, one of the most spectacular waterfalls in Tasmania. I'd highly recommend these side-trails, even more so in the kind of wet weather that we were blessed with. From the waterfalls, it's around another 90 minutes to Bert Nichols Hut at Windy Ridge - much of this is a steady climb to Du Cane Gap, before a short, steep descent to the hut. Our group had chosen to take the afternoon ferry from Narcissus Hut rather than walk the length of Lake St Clair, so we were able to take it easy in the morning and spent some time around camp. There was a ranger at Bert Nichols Hut who was incredibly knowledgeable about the area, and Tasmania in general - it was nice to chat and learn about the history of the Overland Track, and ongoing challenges in preserving the value of wild places in Tasmania. The walk is pretty much all downhill from Windy Ridge to Narcissus, so the 9km felt like a breeze compared to previous days. It was our third straight day of rain, getting wet by now was no longer a worry and it was wonderful listening to the sounds of the eucalypt forest as we made our way down the valley. Even though it felt like we were walking at a leisurely pace, it took us less than three hours to complete this leg before reaching Narcissus, where we radioed the ferry to take us back to the Lake St Clair Visitor Centre for a well-earned meal. The Overland Track is an incredible experience. The facilities are great for a multi-day walk and the track is suitable for anyone with a moderate level of fitness. It's a great walk to do with family or friends - our group ranged from late teens to early sixties, and there were younger families on the trail when we walked. If you have some bushwalking experience already, this is a wonderful way to fully immerse yourself in the Tasmanian Wilderness. 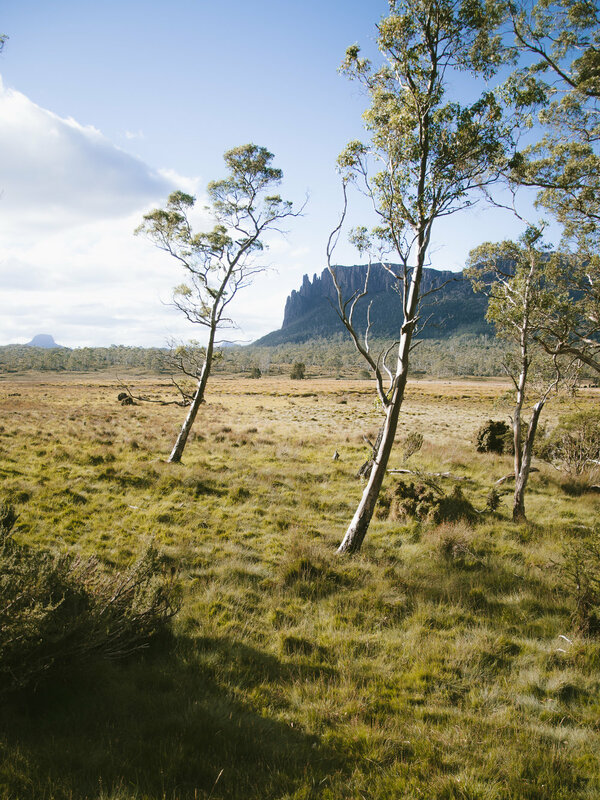 If you prepare well, the Overland Track is almost guaranteed to be an experience you will remember for a long time.